Home » Blog » General Health » High Temperature in Children: Does it Have a Purpose? What Makes a Fever Successful? High Temperature in Children: Does it Have a Purpose? What Makes a Fever Successful? Are fevers to be welcomed or feared? Does a high temperature have a purpose and what makes a fever successful? How do you feel when your child has a temperature? If so, you’re not alone. Nobody likes to see their child feeling unwell or in discomfort. Your natural reaction is to want to do something immediately to help your feverish child. By getting rid of the fever, you’ll be getting rid of the illness, right? In fact, bringing down the temperature at the first sign of sickness, while it may make your child feel more comfortable in the short term, can actually prolong the illness in the longer term. (1), (2) and (3). That’s because a fever has an important role to play in helping your body to defend itself against a virus or bacteria. Not letting a fever do its job can actually make it harder for your child to fight the infection. Despite this information, many parents tell me they are afraid to let their child have a fever. would it help you to know exactly what your immune system is doing during a fever and why? Normal body temperature is around 36.5c. More than 1 degree above normal is regarded as a fever. In practice 38c would be regarded as a fever and anything above 39.4c would be called a high fever. Normal temperature can vary slightly from person to person, so it’s a good idea to take your child’s temperature when they are not sick so that you know what is normal for them. A rectal thermometer tends to read one degree higher than if it is placed in the armpit, so it’s a good idea to be consistent about where you measure the temperature. The most common cause of a fever is a viral infection. The second most common cause is a bacterial infection. Poisoning or heatstroke are much less common causes of fever. What Happens When You Get Sick? Viruses and bacteria are always in our environment to some extent. Being healthy doesn’t guarantee that you will never get sick. If you are healthy, your resistance will probably be good so that you don’t fall sick too often but when you do, your immune system is able to spring into action to defend you and to overcome the invading bugs. Once your white blood cells detect that a virus or bacteria is present in your body, their number increases and they rush to the area of infection. In the process, they release chemical messengers called phagocytes. The phagocytes release pyrogenic chemicals which cause the Hypothalamus to release Prostaglandins. These Prostaglandins then act on another part of the Hypothalamus, telling it to turn up the body’s thermostat, in order to produce a fever. These proteins get their name because of their ability to interfere with the reproduction of bacteria and viruses. Interferons don’t kill the invading germs but they stop them from reproducing. This limits progression of the illness. Proteins are crucial to the structure of bacteria and viruses. Because proteins break above 37c, the higher temperature destroys bacteria and viruses. These are an essential component of the immune system’s defence force. This brings white cells more quickly to the area of infection. This is crucial to bring faster repair and healing. Despite its impressive role in defending the body against attack, the effects of a fever are not all good. The increased metabolic rate gets through water very fast, especially if there is a lot of perspiration. Infants and the elderly can lose water rapidly. It’s important to replace the lost water by offering warm or cold drinks, as preferred, throughout the illness. Dehydration may pose an increased risk for children who are in an already weakened state, perhaps as a result of previous illness, or if they’ve had recent surgery or are under-nourished or very young. This is because it is not just germ proteins that are destroyed. There will also be damage to your own body proteins and the body will need to find the energy to replace these. You will need some time to convalesce and regain your energy when the illness is over. Check out my Chicken Bone Broth Recipe to help your recovery after fever. during a fever as fat stores are broken down to supply energy to the body. A feverish child needs nursing care at home. They will not be able to go to school or creche and a carer may need to take time off work. Most sources mention 41.5c as the temperature above which brain damage can occur. It’s very rare for the body temperature to climb this high as a result of infection. It could happen as a result of sunstroke or if the air temperature is very high. An example is a child left in a closed car during hot weather. This is quite different to the immune system’s reaction to a virus. With heatstroke, it is necessary to reduce the temperature by cooling the body immediately. What’s Going On in Your Body During a Fever? In an ideal scenario, when the immune system is functioning well, there are 3 stages to a fever: Chill, Stasis and Crisis. Everyone will recognise this stage easily. Let’s say you’ve caught a cold or a sore throat. Your temperature was at a normal 36.5c. As soon as your immune system detected the presence of a virus, your white cells sent the messengers (phagocytes) to get your body’s thermostat turned up. Let’s say the Hypothalamus decides that your virus-fighting temperature needs to be 39c. It takes time to bring your body temperature up by 2c. During that time you will feel cold. You may shiver because muscle contraction is a method the body can use to generate heat. Vasoconstriction occurs. This is where blood vessels are narrowed in the skin to divert the blood inwards. This makes you look pale. Your skin feels cold. The best way you can help yourself at this stage is to go to bed with a warm drink and a hot water bottle. Help your body to reach the necessary temperature and give it the rest it needs so that all available resources can be used to fight the virus or bacteria. At this point, your body has warmed up to the temperature it was aiming for. Your thermometer is now showing 39c. Now the battle against your virus can begin. During the battle, viral or bacterial germs are being killed and their cadavers are being broken down, ready for elimination. Toxins released by the germs themselves will also need to be neutralised and excreted. To lessen the impact of these toxins and waste products on the body’s tissues and organs, the body retains water, so you will have very little perspiration or urination at this time. Your hypothalamus continues to release prostaglandins to keep the temperature up so that new white cells continue to join the battle, interferons continue to interfere with germ reproduction and the higher temperature continues to destroy germ proteins. Your body will stay at the higher temperature until the infection has been dealt with. The moment the infection has been removed, the hypothalamus stops releasing prostaglandins and your internal thermostat is reset to its normal temperature of 36.5c. Now your body needs to cool down from 39c to the new setting of 36.5c. You start to feel hot. You start to perspire. The blood vessels dilate to allow the blood up to the skin’s surface to cool your body. Your skin looks red and feels hot. This is referred to as the fever “breaking”. As well as cooling the body, profuse perspiration has a role to play in the elimination of dead germs and germ toxins. Increased urination is another route of elimination. The perspiration and urine may be strong smelling and concentrated. Waste products may also be eliminated through the lungs in the form of foul breath, or a bad taste in the mouth and on the skin in the form of pimples, a rash or blotches. Depending on the type of illness you are suffering from, there may be diarrhea or vomiting as part of the process of elimination. During this elimination phase, you will probably feel at your worst but if your fever has been successful, the infection is clearing and you will soon recover. Increased urination and perspiration are good signs that this is happening. In reality, the stages of fever are not always so clear cut. There may be a cyclical fever, where you go through each of the stages more than once because all of the germs were not eliminated the first time. There may be a low-grade fever, where the phases are less distinct. You can have a continuous fever, where the stasis phase goes on longer than 24 hours. What Do Paracetamol and Ibuprofen Do During Fever? The main reason people give paracetamol and ibuprofen during a fever is to relieve pain. They also prevent the production of prostaglandins, so that the fever is reduced or stopped. If you take paracetamol or ibuprofen to reduce your fever, you may feel better but you will lose the benefits of a fever and your immune system may not be able to eliminate the virus or bacteria or to resolve the infection. When an acute inflammation is not resolved, it may become chronic or recurrent, as mentioned above. What Do Homeopathic Remedies Do During Fever? A homeopathic remedy is prescribed not just for the fever alone. The remedy is chosen to match your full set of symptoms. In this way, the same remedy that treats your fever will also treat the pain and inflammation of your sore throat or ear infection. Time and again in my practice, I see that a well-chosen homeopathic remedy helps the body to move on from one fever stage to the next. By facilitating the natural process, discomfort is lessened and the duration of the illness is shortened. In my homeopathy practice I frequently see children who suffer from recurrent infections, often taking antipyretics and antibiotics on a monthly basis. I notice that children who are never allowed to run the slightest fever are more likely to suffer from recurrent infections. It appears that their immune system is trying, again and again, to overcome the same virus or bacteria. In some cases, the immune system is so suppressed that it is no longer able to produce a fever. In homeopathy, we treat this situation, first with a constitutional remedy to boost overall health and then with acute remedies, as the need arises, to treat the flare-up of the recurrent condition. 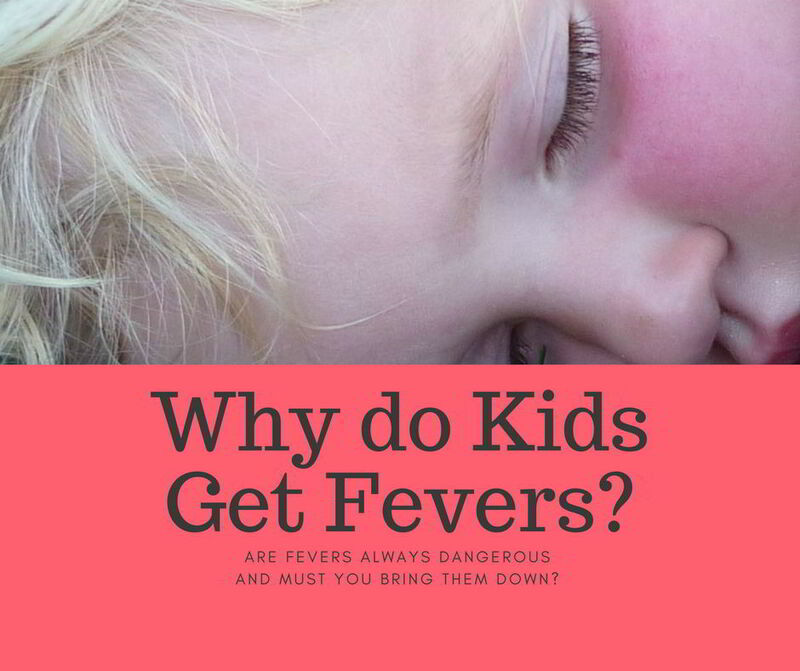 Numerous times I have seen that, as parents learn to observe their child’s symptoms and have them matched with an effective acute remedy, they gradually lose their fear of fevers; the immune system gets stronger and the tendency to recurrent infections fades away. In my next blog post, Natural Treatment for Fever, I describe a few of the most popular homeopathic remedies used during fever and outline the main symptoms you need to observe, before choosing the best remedy to help your child have a successful fever. This post is intended for informational purposes only and does not constitute medical advice. Content is not intended to be a substitute for professional medical advice, diagnosis, or treatment. Always seek the advice of a physician or other qualified health provider with any questions you may have regarding a high temperature in your child. Never disregard professional medical advice or delay in seeking it because of something you have read on this website. A baby of 3 months or younger who develops a fever should always be medically checked because of the risk of bacterial infections in a small child. Carmel O'Keeffe is an experienced Classical Homeopath with specialist training in homeopathic detox. She offers homeopathy for all the family through 1:1 consultations, in person and online.